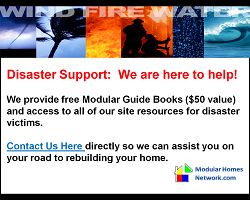 Modular Homes Buyers Resources and Guides. 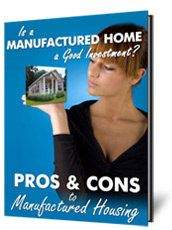 Get info on manufacturers, builders, floorplans and prices for Modular and Manufactured Homes. Modular Homes - A Smart & Affordable Way to Build! With the advances of modern technologies, modular homes are revolutionizing the way homes are built today. Starting by overcoming the misconception that homes built in a factory are poorly constructed and don’t measure up to stick-built traditional homes, people are learning about the advantages in price, efficiency, durability, quality and environmental advantages that a modular home offers. And today's modern modular homes can be built and customized to any design you can dream. Gone are the days of the past box-like look. At Modular Homes Network you will learn the difference between modular homes, manufactured homes and prefab homes. The advantages and disadvantages with each construction method and which factories in North American offer the best constructed homes at affordable prices. 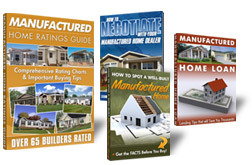 Be sure to check out our FREE E-Books about modular and manufactured homes. They are a great resource to help you get the best deal on the largest purchase of your life. The modular housing industry represents both cutting-edge technology and quicker build-times. Homes are assembled in a controlled environment - out of the weather, which increases efficiency and minimizes chances of other issues like damage and mold. Factories purchase their materials and supplies at huge discounts and pass these savings onto their customers. Unbiased modular home ratings and reviews on over 80 different manufacturers in North America. If you're just starting your search for a modular home our "Modular Home Ratings Guide" is a must read! With over nine years of research and countless interviews, you will learn how modular home companies compare to each other in the areas of: Quality Construction, Design/Style, Appraised Value and Price. Our staff rates each modular home plant, based on: data collected from interviews with each company, various builders and associations within the industry. You can spend months or years researching different builders or you can read our best-selling resource and know who's who in the industry in a matter of hours. Don't waste your time driving from one builder to the next only to hear, "This factory builds the best homes". Get the facts with fair and balanced ratings from a consumer group with no ties or connections to the modular housing industry. Imagine having unbiased ratings for over 65 different manufactured home factories in North America at your finger tips. With concise reviews, comprehensive rating charts and money saving tips, it’s no wonder our publication is considered the best consumer resource for manufactured home buyers. Our best-selling book has helped tens of thousands of buyers just like you find quality manufactured home companies that meet your expectations without breaking your budget. Our guide is up-to-date with accurate information based on solid research. While it is impossible to know the financial stability of every manufactured home factory, we have done our best to put forth our findings based on data collected from a variety of sources. Why choose Modular construction over traditional building methods? Modular homes or sometimes referred to as system-built homes are built in a controlled environment, utilizing cutting edge technology. Modular homes can be built from existing floor plans or from custom floorplans. System-built homes have no design limitations - they can be any shape or size and will meet or exceed your local and state building codes. There are fewer restrictions on placing a modular home and interest rates for new construction loans are the same as compared to building a conventional home. Are Prefab or Panelized homes the same as Modular homes? Panelized homes or sometimes referred to as a prefab homes can represent a number of construction methods. The most common method involves the building of individual walls, or wall sections in a factory. Panelized home builders are the biggest and most diverse segment of the factory-built housing industry. Panelized homes are different compared to modular and manufactured homes. There are some similarities, but prefab homes utilize “Components” or “wall units” that are pre-built in a controlled, factory environment. Once the re-built walls are delivered to a job site, a general contract or the home owner acting as the owner builder will erect the walls. Only the walls are assembled at the factory and the majority of work still remains on-site. The main advantage of panelized homes over stick-built homes is - shorter build time because walls are pre-built and lower labor costs. Learn more about the benefits of panelized homes. How much do Modular homes cost? According to industry statistics, modular construction projects have more than doubled in the last ten years. This is because the modular building process provides time and cost savings. Since they are built inside a factory, the weather does not cause delays, which greatly reduces labor costs. All the fabrication being done at one location allows the factories to buy bulk quantities of supplies at greatly reduced rates, these savings are then passed on to the consumer. The costs will vary depending on where you live, but a general guide is that Genuine modular homes will cost $50 to $80 per sq. ft. (not including property). To build a stick-built home the average cost is around $80 to $150 per sq. ft. (not including property). Over the years I have spoken to many modular home builders regarding cost and savings. 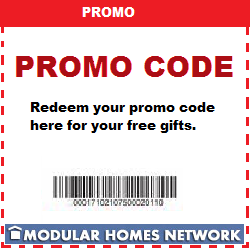 Some say that by using modular construction you can save 30% or more. Others I have spoken to take a different approach and say there is no real cost savings, except quicker build times. And still others say one can typically save 10% to 20%. I tend to lean towards the later point of view and estimate the savings to be around 15% with quicker build times of three months or less compared to stick-built construction. With quicker build times and a possible savings of 10% to 15% it’s clear why more and more people are turning to modular housing. What are the differences between a Modular & Manufactured home? There seems to be some confusion about the differences between a modular and manufactured homes. Modular homes are not manufactured homes or mobile homes. Manufactured homes are built according to the federal building Code, (HUD). This requires all manufactured homes to have a non-removable steel chassis, which severely limits their design options. Manufactured homes generally come in single units or two-section units. In certain parts of the country you can also find three and four-section units. A manufactured home can be placed on a basement. In general, manufactured homes are single-story homes that are placed on a blocking system that supports the steel I-beams under each section. Today’s homes come with many of the same features typically found in a standard stick-built home: living and dining rooms with vaulted ceilings, skylights, fireplaces, modern kitchens and premium appliances, large bedrooms with walk-in closets, bathrooms with whirlpool tubs, ceramic tile, hardwood floors and more! The options are almost limitless! The industry boasts they are the most affordable option when it comes to housing, with costs normally ranging from $35 to $65 per square foot, (home only). Additional costs include land purchase and site improvements. Are Modular homes environmentally friendly? The days are long gone when just calling yourself a modular home or prefab company is considered environmentally progressive. Modular homes are now being made from materials like reused shipping containers, recycled steel, recycled plastic and certified sustainably-harvested wood. The new challenge for the modular housing industry is balancing the economics of innovative sustainable design with the realities of construction costs. The majority of modular home companies in the United States are ENERGY STAR® ready. That means when a home leaves a factory, it is an ENERGY STAR® certified home. These homes must meet the guidelines for energy efficiency set forth by the U.S. Environmental Protection Agency; that is, they must be at least 15% more energy efficient than homes built to the International Residential Code (IRC), and include additional energy-saving features that typically make them 20–30% more efficient than standard homes. Going green can increase your home’s value and give you an edge when you’re ready to sell. Another big advantage is energy savings, which can save a homeowner thousands in only a few short years in heating or cooling costs. Green modular homes can be more durable through the use of recycled construction materials. You’ll improve the quality of the air you breathe which, studies show, can make you more productive. Less formaldehyde is always good. A green home’s construction creates less material waste and a green home helps preserve its surroundings because it is built with the land, not against it. Building a home is one of the most important events that you will undertake in your lifetime. It is a large investment as well as your largest asset. Your home will be where you entertain family and friends; it is your comfort zone. When you are ready to undertake this project you will need to be well informed. Savvy homebuyers already know that modular homes offer more for their hard earned money than standard built homes. Designed in a factory, built in sections, and assembled on site. This controlled process allows for reduced costs, better craftsmanship and the ability for the homeowner to purchase a larger home. They are not mobile homes. Mobile homes or house trailers are built on wheels and are meant to be moved. A modular home is secured on the property just like a standard built home. What many modular home buyers worry about is finding the right contractor to assemble their new home. Well, there is no longer any reason to worry. Modularhomesnetwork.com has taken all the issues out of finding the perfect contractor. 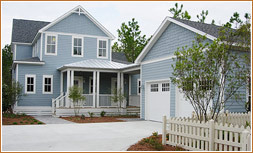 Modular homes network is a nationwide network of modular home builders. These contractors have met all the requirements necessary to qualify as modular home builders. These professionals are the “go to” companies in the industry. When you fill out the contact form on our site, you will receive our guides about building a modular home. These free guides will help empower you, as the consumer, so that the home building process will be smooth sailing. When you educate yourself you will be able to purchase, and build, your home worry free. The information you will find in our guides is a compellation of many months worth of research and verification. You will receive these useful guides when you fill out a request for information from a builder in your state. There is an old cliché that states “knowledge is power”. This could not be any truer than when you are building your own home. Equipping yourself with the right information, that is well researched and complete, will allow you to make all the right choices when building. Home ownership is said to be one of the greatest gifts that one can give them selves. Make sure that you do not need to re-gift your purchase by taking advantage of the free guides offered here. Our best-selling books and free guides has been helping home buyers considering modular housing since 1999. We have been providing unbiased reviews and comprehensive ratings on over 80 different modular home factories in North America. “Modular Home Ratings Guide” was first published in 2000 and since then has been updated ten times. This comprehensive resource guide is for prospective modular home buyers. The book is packed with everything you need to know from selecting a manufacturer to negotiating with your builder, financing options and everything in between. We dispel the misconceptions about the limitations of modular construction and shows potential buyers that a factory-built home can be as good as, if not better than, houses built with traditional stick-frame construction. In our book you will learn how to choose the best builder for your project, how to select the right loan and how to negotiate with your builder. XML error: System error: -2147012889. Are you interested in the benefits of building or buying modular homes? Would you like to learn more about modular homes so that you can decide if buying one is an option for you? This article will help you learn what you need to know about modular homes. Many people confuse modular homes with mobile homes. The truth is there could not be anything more different than these two types of structures. A modular home is a solidly built home that has been built in sections at a factory. A mobile home is a structure that is built on wheels and is designed to be able to move at any given time. A modular home is a home that is manufactured in a factory and brought to a site for final construction. Modular homes are not mobile homes, there are no wheels involved. They are simply, homes built in sections and assembled on site. The modular housing industry is losing market share during these difficult economic times. One reason for the decline in modular home sales is prices in some cases have gone up because of the overhead at many modular home factories. This recession or depression whichever term you prefer is really hitting the housing market hard. While interest rates are at an all time low, new home sales are down by 60% across the country. Expert Randall Eaton says, “I have spoken to a number of modular home plants and many are focusing on commercial building projects to keep the doors open”. Manufactured Homes Have Come A Long Way! Single-wide manufactured homes have come a long way in recent years. Not too long ago the mere mention of a mobile home would conjure up images of a small tin sided box made from 2x3 lumber and no insulation. California Modular homes continue to attract new home buyers as more and more people recognize their advantages compared to stick-built options. Modular housing construction combines both high-tech modern architecture and efficiency, which is why potential home buyers are enticed to look at a modular home. Modular Homes - The truth about Modular Housing - In recent years, more and more homebuyers have become aware of the advantages of owning a Modular Home. With the advancements of modern technology, the industry is overcoming the misconception that factory made homes are all poorly built and don’t measure up to stick-built homes. One of the greatest advantages to manufactured homes is that they are constructed entirely within a controlled climate. Construction can continue year round and because the assembly line workers don’t need to be skilled carpenters they can work for much less than what on-site contractors are normally paid. The benefits of this time and cost reduction can be passed on to the home buyer in the form of very significant savings.